ComfortConsultant is for use by Westinghouse contractors. 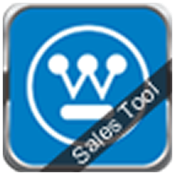 Meet ComfortConsultant, the Westinghouse HVAC sales consultation app that offers direct customer interactivity during the sales presentation. Homeowners enter their requirements, and then select their new home comfort system without the high-pressure tactics of a typical sales call. The customer can add equipment selections to the shopping cart while the contractor makes recommendations to upgrade them to higher-ticket purchases. •More engaged homeowner is more likely to buy. •Makes upselling equipment and IAQ products easy. •Easy-to-use app lets you input prices, rebates and special incentives. •Pre-loaded with all Westinghouse equipment. You select the equipment you want to show to a particular homeowner. ComfortConsultant eliminates the “Moment of Truth” most salesmen encounter when they slide their price across the kitchen table. It will revolutionize the way you sell HVAC to your customers. Does not require an Internet or 3G subscription to use. Please view the Support page on www.CCWestinghouse.com for important installation and setup guides.